How many Matthew Brodericks does it take to anchor a Gershwin revue-sical? Just one: He stands stock-still, and the whole show revolves around him. I don’t mean this as a criticism of Nice Work if You Can Get It, the perfectly lovely pan-Gershwin amalgamation of tunes and Prohibition-era tropes cleverly assembled by director-choreographer Kathleen Marshall (Anything Goes) and book-writer Joe DiPietro (Memphis). On the contrary, I say it with admiration. Broderick, as he himself has noted on more than one occasion, is not a trained singer or dancer. His unique stage presence depends not on razzle-dazzle but on his ability to slip a dry jibe sideways to his conspirators in the audience: On some level, he’s still Ferris Bueller, and we still feel lucky to be his confidants. The leggy, lissome ensemble of Nice Work steers him from mark to mark, at one point actually rolling him on a human conveyor belt. And that more or less sums up the show: Watching an irresistible force meet an agreeably movable object. 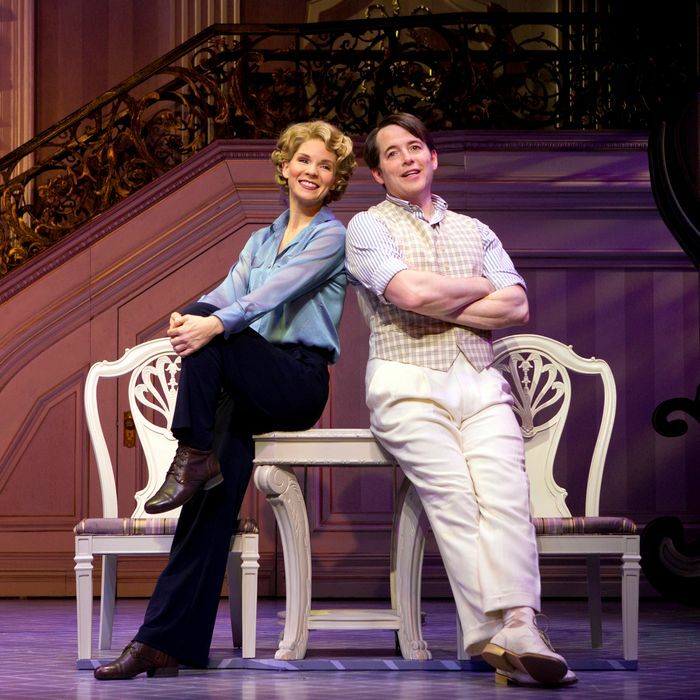 As the perma-sozzled, dimwitted, oft-married heir Jimmy Winter, Broderick — having been delivered to his marks by the tide of Marshall’s choreography and staging — proceeds to nail his gags dead-on, make it tipsily through his big dance with his towboy bootlegger love-interest Billie Bendix (Kelli O’Hara), and warble George-and-Ira’s melodies with pleasant Muppetry. Who could ask for anything more? Well, occasionally, one could ask for perhaps just a little more: Just a tiny dram more, perhaps, of O’Hara. (Is there ever enough?) Playing the steely dame who exploits credulous Jimmy for use of his beach house (to hide a shipment of hooch from the law), then, wouldn’t ya know it, falls head over heels for the clueless party boy in spite of herself, O’Hara charms us effortlessly in her torchlit solos. She interprets songs that are more or less tattooed on the inside of our eardrums (“Someone to Watch Over Me,” “But Not For Me”) with sweet clarity and refreshingly pellucid unaffectedness, all the more memorable for being direct, strong, and sincere. Then she stretches herself in a risky physical-comedy number: Marshall has revamped “Treat Me Rough” (from Girl Crazy) as a brassily hapless vamp act, performed by a woman who’s never learned to be a “dame.” O’Hara’s not known for her pratfalls, and the wonderfully undignified maneuvers she executes here have a noticeably studied quality to them. This isn’t her natural dance, but she more than manages, and if the number falls ever so slightly short, it’s a game attempt, the kind you want to cheer for. I could’ve used a bit more of the golden-throated stage comedienne Jennifer Laura Thompson, too. She’s Jimmy’s insufferably haughty dilettante fiancée, Eileen Evergreen, “the finest interpreter of modern dance in the whole world!” (“Why, she’s so brilliant,” brags Jimmy, “when she steps onstage, no one has any idea what she’s doing.”) Thompson is the fulcrum of Marshall’s most tangily imagined production number, “Delishious,” which involves a deceptively intimate hot tub and towel roughly the length of the proscenium. But beyond this showstopper, she’s got little to do but sulk. Nice Work is a bit of a paradox: The show’s written for a passel of genius hams, in a delicate web of mutually assured mugging. Sometimes, a stage crowded with talent results in a bit of Mexican standoff. But I nitpick. Nice Work is a lovely, witty diversion, thanks to some deft gag-smithing and half-serious story-spinning on the part of DiPietro. (He’s very loosely cultured his story from the protoplasm of the Gershwins’ 1926 Oh, Kay!, written by P.G. Wodehouse and Guy Bolton.) Marshall’s musical troika (orchestrator Bill Elliott, musical director Tom Murray and music supervisor David Chase) have sculpted a swelling throughline score out of Gershwin’s songs and instrumental compositions, with judicious, occasionally rather sly quotes from Rhapsody in Blue, The Three Note Waltz, and many others. Nobody fills a big space like Marshall: She has the great Judy Kaye (as the villain of the piece, the teetotaling totally T.O.’d Duchess Estonia Dulworth) literally swinging from a chandelier at one point — and that’s not even the finale. Running the show is plucky character-actor genius Michael McGrath, who plays Cookie, a short thug with a short fuse and a talent for managing chaos. He’s a dynamo, and the show’s driving force, its Bugs Bunny id and Daffy Duck spoiler, all in one package. (Chris Sullivan, as his big-lug sidekick Duke, is no slouch either.) Robyn Hurder takes the dumb-blonde role up a notch or five, and Stanley Wayne Mathis (who performed in a 1990 revival of Oh, Kay!) furnishes some near-surreal comedy as a suspicious yet easily misled local cop who simply won’t go away. Did I mention that Estelle Parsons is in this show? She is. Your cup runneth over. Nice Work is perfectly nice work, an old-fashioned romp with a well-deployed prop in the center ring: If the show is Jackie Chan, Broderick is the vase he’s juggling. The difference is, we’re rooting for this vase to stay intact. It doesn’t disappoint. Nice Work If You Can Get It is playing at the Imperial Theatre.